Ever since visiting Japan in 2016, I’ve been wanting to replicate the soft white bread loaf omnipresent across the country. It’s the fluffiest and most delicate bread I have ever eaten. It’s not like brioche, it doesn’t have the same richness. Japanese milk bread is white bread indulgence of the most feathery kind. 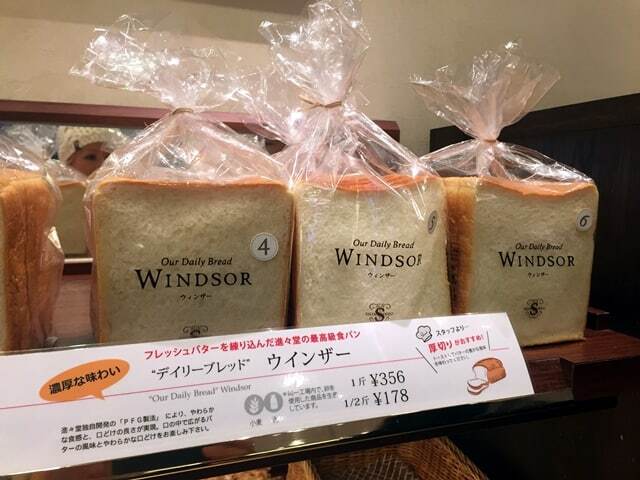 Mini plastic bread in Japan – wonderful! I’ve taken the last few weeks to research the method behind the Japanese milk bread loaf. 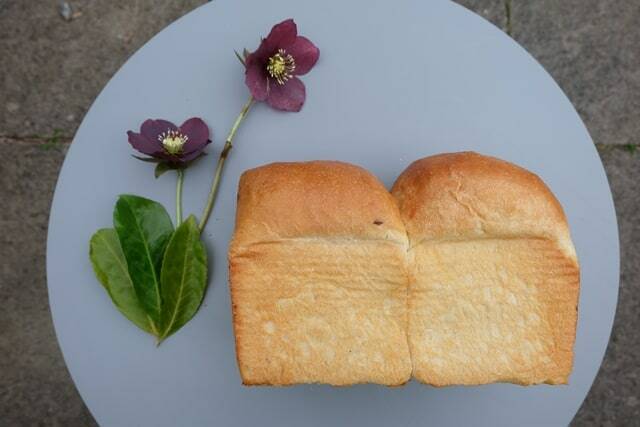 Much like Felicity Cloake and her ‘How to cook the perfect…’ quest, I’ve been trying different recipes in my search for the perfect homemade Japanese milk bread recipe. 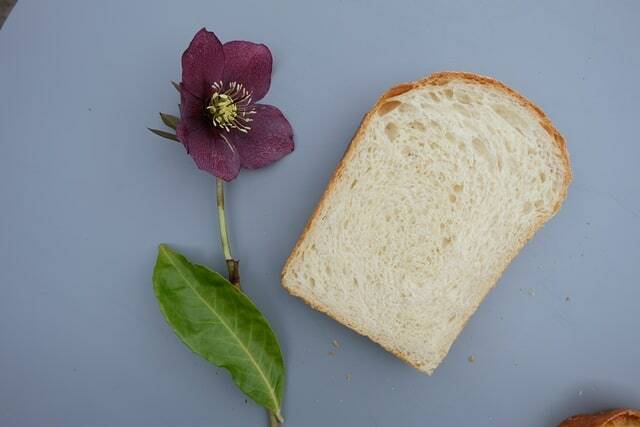 An additional reason for looking into Japanese milk bread just now is that I wanted to learn how to bake this lofty white loaf for my little baby daughter, to make eggy bread and baby pizza slices. 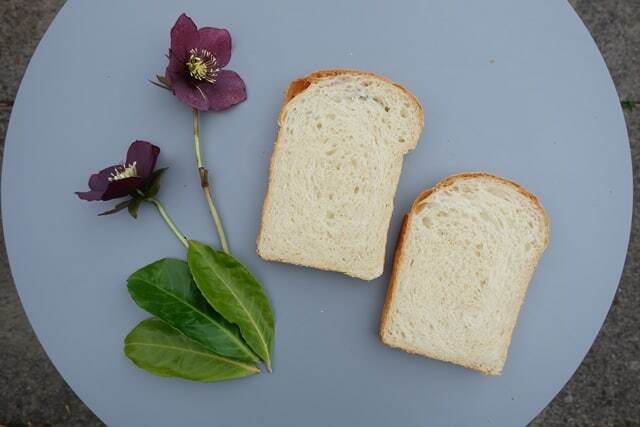 Milk bread was developed in Japan in the 20th century, using Tangzhong, a warm flour-and-water paste traditionally used in China to make buns with a soft, springy texture and tiny air bubbles. According to this article in the Japan Times, people started to take bread seriously as a meal staple rather than a snack after the violent Rice Riots of 1918. 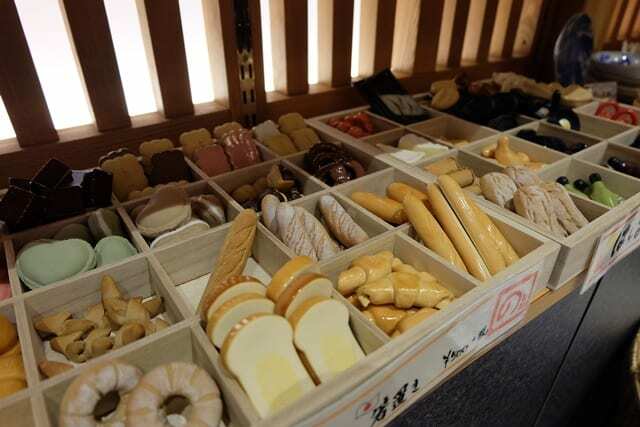 The Chopstick Chronicles mention that the Yudane method subsequently originated in Japan and became a widespread and popular way to bake bread after Yvonne Chen introduced Tangzhong roux as a secret ingredient in her book called “Bread Doctor”. I looked into both the Tangzhong and Yudane methods of baking, and want to briefly outline the difference between these methods (thank you to Lynn Lim for this informative Facebook thread). 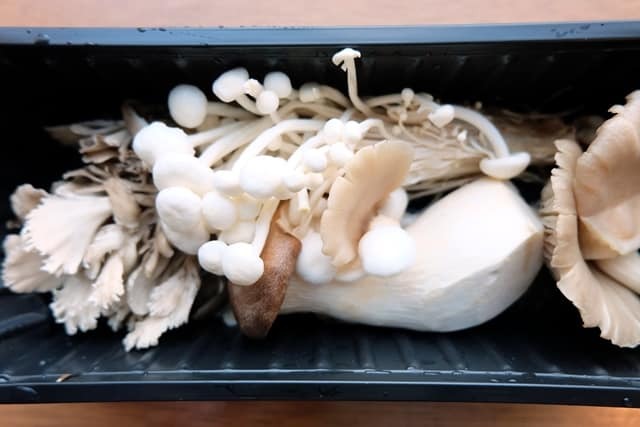 For my Shokupan recipe – after many experiments using both methods – I’ve settled on a combination of this version of Shokupan and the Yudane process. This method uses boiling water to scald the flour. Ratio 1 part flour to 1 part water. Use after at least 4 hours in the fridge. Use 20% of the flour to make Yudane. For this method, cold water and flour are combined and then heated to 65 degrees Celsius. Ratio 1 part flour to 5 parts water. Can be used once cooled. 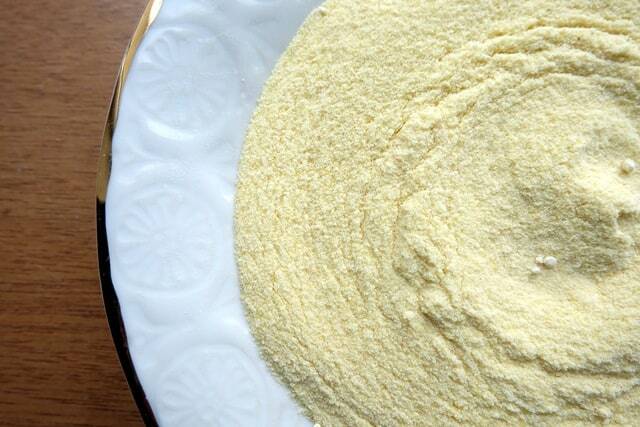 Use 7% of the flour to make Tangzhong. 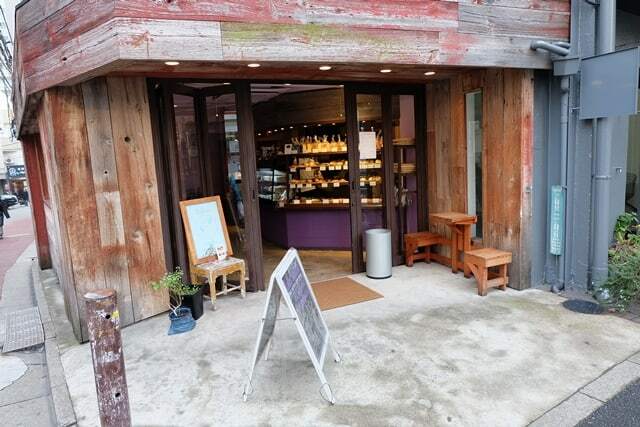 What does authentic Japanese milk bread taste like? 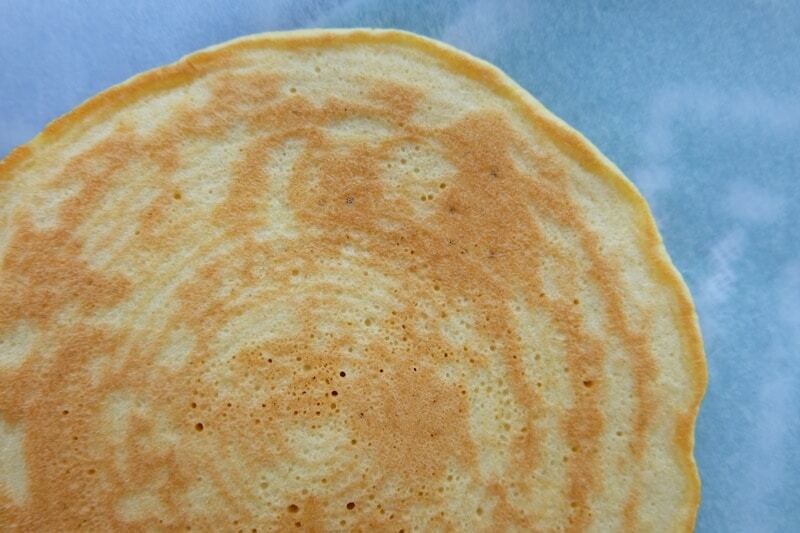 The texture is soft and airy, wonderfully tender. 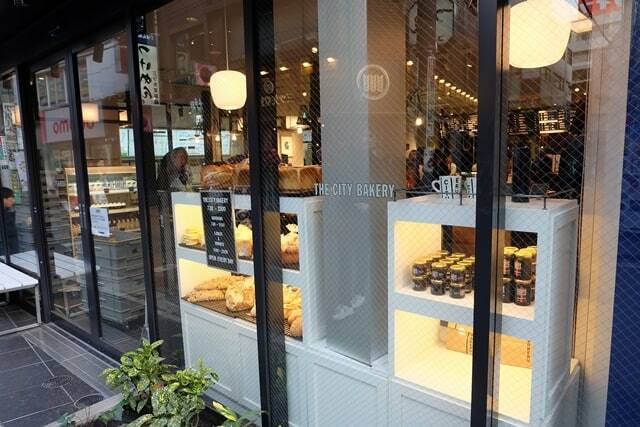 Having tasted milk bread while in Japan, it shouldn’t taste like a super enriched dough (e.g. like brioche). Instead, it should taste like a pure wheat and milk based bread and this is why I have not included eggs in my ingredient list and why I only use a minimal amount of butter in my recipe. It is however important to use whole milk (instead of low fat milk). How to eat Japanese milk bread? It tastes great with most things, but I like to have it simply with salted butter. 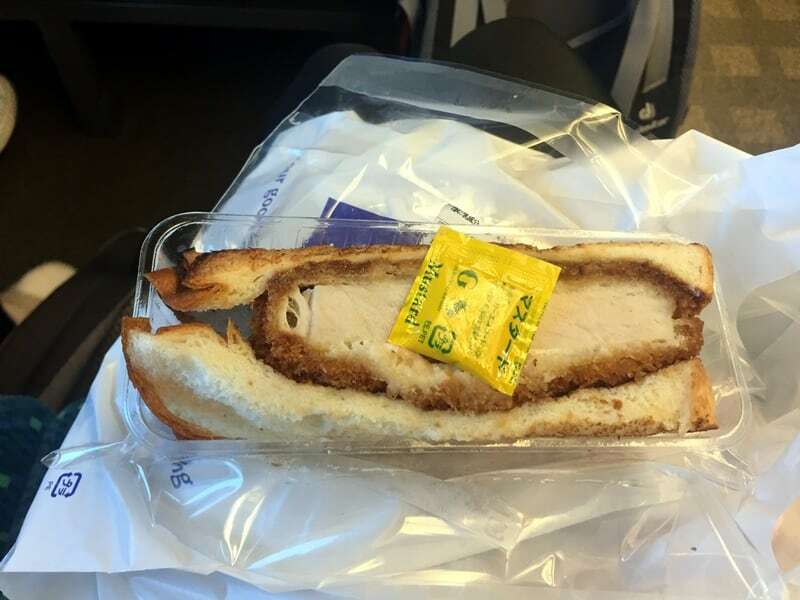 I had it with panko*-breadcrumbed chicken (and mustard) while in Japan which was delicious, the two bread slices acting as wonderful pillows around the meat. A lot of recipes I tried and tested used sugar (up to 60g) but I have decided against the use of sugar in this recipe, especially since I wanted to mainly develop this for use for the whole family including our little baby. Having experimented with both the Tangzhong and Yudane methods I feel that the Yudane method produces better results. I have also experimented with adding more butter and an egg, but prefer the egg-less version with less added butter. I’ve also omitted sugar from my recipe as I prefer a non-sweetened version, for taste and for health reasons. In a small bowl, measure out the flour and pour over the boiling water. Mix until well combined. I use a silicone spatula to do that. Cover the bowl and let the the Yudane cool down to room temperature. In a large bowl, combine the main dough ingredients and add the cooled Yudane. Knead for about 10 minutes until completely smooth and elastic. Don’t cut the kneading time short! Cover the bowl and leave to rest at room temperature for about an hour. The dough should rise well during that time. Deflate the dough and divide it into two equal parts to make loaf. Shape the two parts and place them into the pan, smooth side up. Cover with a plastic bag to keep the moisture in and keep at room temperature until fully proofed, about 1.5 hours. Brush the loaf with milk and bake at 180°C for about 30 minutes, until golden brown on top and a digital thermometer inserted into the center of the loaf reads at least 93°C. Remove the loaf from the oven, and cool it on a rack. When it comes to feeding, my little baby daughter has never been a natural. And when I recently started to introduce solids, she steadfastly refused to be given anything from a spoon or my finger. No tasty purée could tempt her. She did however take the spoon if it was put in front of her on her tray and into her mouth it went. I started giving her chunky finger foods such as broccoli florets which she could hold herself and after a few weeks I decided it was time to introduce some baby breadsticks for more a baby-led weaning approach. Pieces of toast and firm bread make good finger food and can be dipped into purees and sauces. Many baby rusks on the market contain as much sugar as a sweet biscuit. Opt to make your own sugar-free breadsticks instead. It's super easy and you can make a big batch, freeze them and defrost as needed. You can add some herbs or spices into the breadstick dough if you want to mix it up for your baby. I sometimes divide the dough into three parts, leaving one part plain (with no added herbs or spices) and adding different herbs such as finely chopped rosemary or spices such as garam masala to the other two parts. For those worried about food allergies, Annabel Karmel’s New Complete Baby and Toddler Meal Planner states: “There is no need to worry unduly about food allergies unless you have a family history of allergy or atopic disease. The incidence of food allergy in babies with no family history of allergy is very small (approximately 6%). (…) Don’t remove key foods such as milk or wheat from your child’s diet before consulting a doctor. After a mini break from blogging due to the arrival of my sweet little baby daughter, I wanted to share my current go-to sourdough bread recipe with you. This multigrain sourdough bread has been the weekly staple loaf in our house over the last six months. 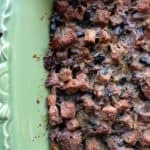 It’s a super easy, yet wholesome and delicious recipe which I found easy to integrate into my new-baby-routine. 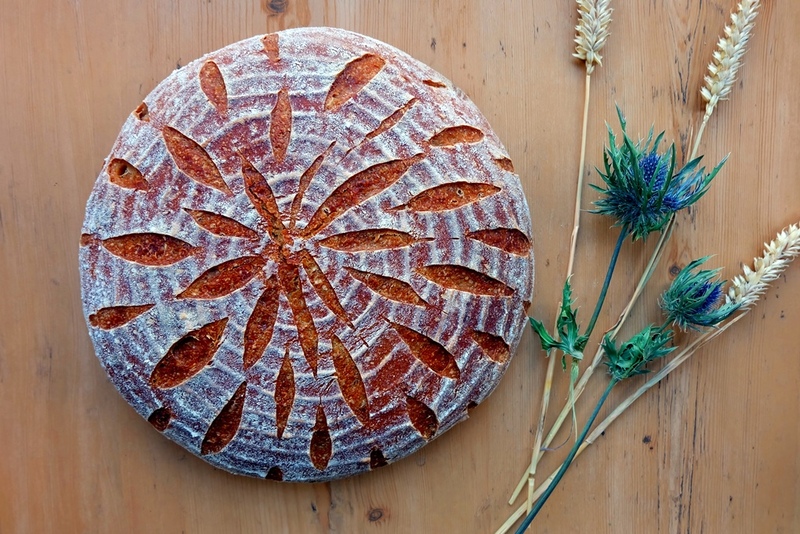 As with most sourdough recipes, it’s not difficult to fit the required steps into your day. A few small steps at a time, 5-10 minutes here or there, is easy to fit around even a newborn baby’s needs. Since giving birth, I use my grain mill a lot more. I now just have bags of grains (wheat, spelt, rye, oat, barley) at home and mill to fine flour or more roughly chopped grain mixtures as I see fit. I still need to use white flours as all flours milled by the grain mill are naturally wholegrain. 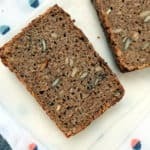 Don’t be put off by the amount of steps needed – you will only need a few minutes at a time to bake this delicious multigrain loaf. 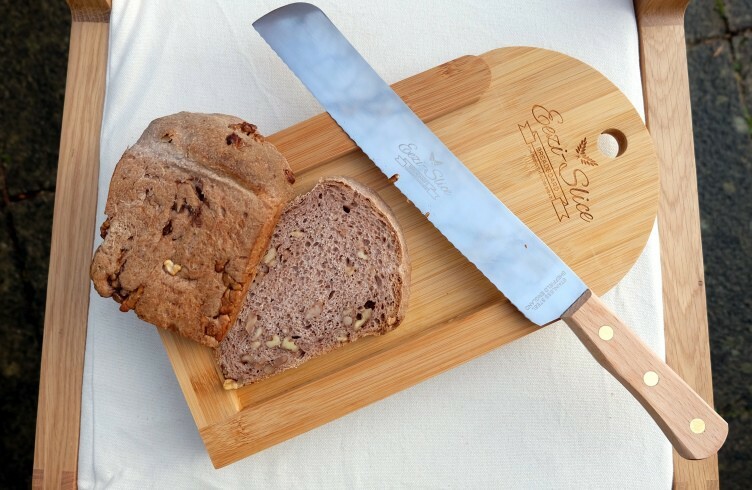 This is a solid loaf of bread full of delicious chopped whole grains and toasted seeds. 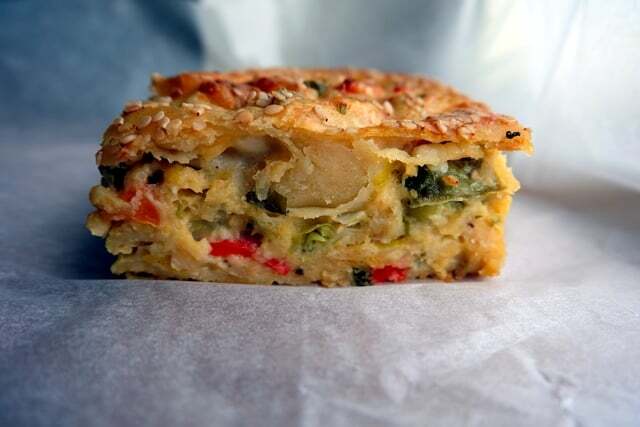 It tastes delicious with both sweet and savoury toppings. With my grain mill it's easy to make any combination of multigrain flour, three grain bread, four grain bread etc. This particular five-grain sourdough bread recipe uses a five-grain mix but you could easily use fewer grain varieties to the same effect, according to what you have at home or personal preference. 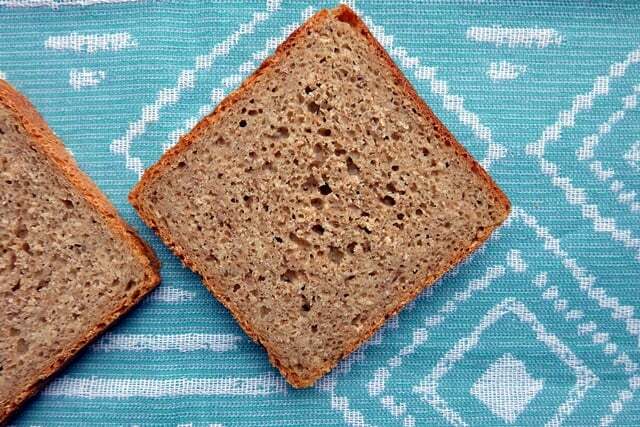 The recipe for this bread is a modified version of the loaf '5-Korn-Kruste' from the book Rustikale Brote in Deutschen Landen. If you are using a mill at home to prepare the flour and chopped grains prepare the various portions as needed on the day. 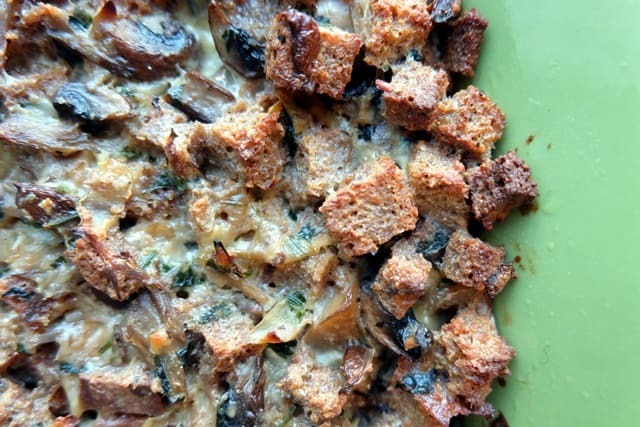 Combine the sourdough ingredients in a medium bowl. Mix well and cover. Keep at room temperature for about 16-24 hours. 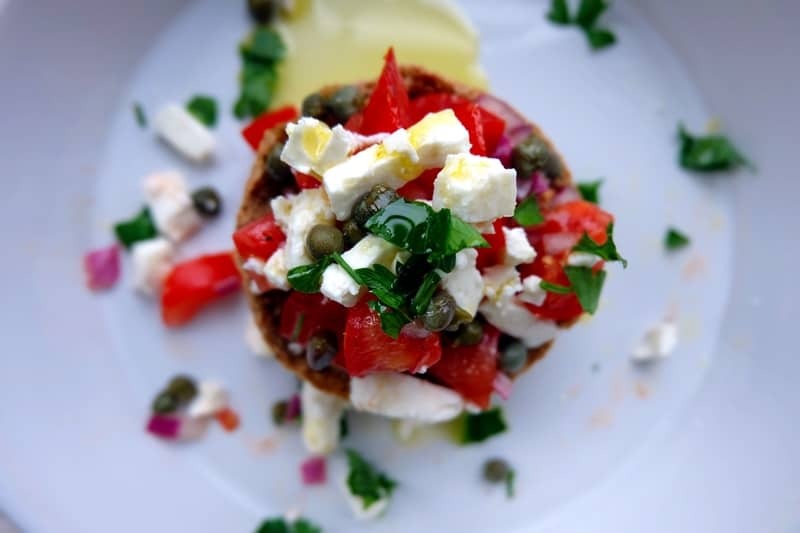 To prepare the toasted seed and grain soaker, toast the seeds in a frying pan (without oil i.e. dry) until they start to release their nutty smell. Take the pan off the heat and add the chopped grains and salt. Mix well, then cover with boiling water. Cover the pan and leave to rest at room temperature for 16 hours. Combine 240g of the refreshed sourdough with the seed and grain soaker and the other main dough ingredients in a large bowl. Knead for 10 minutes, then cover the bowl and leave to rest for about 45 minutes at room temperature. 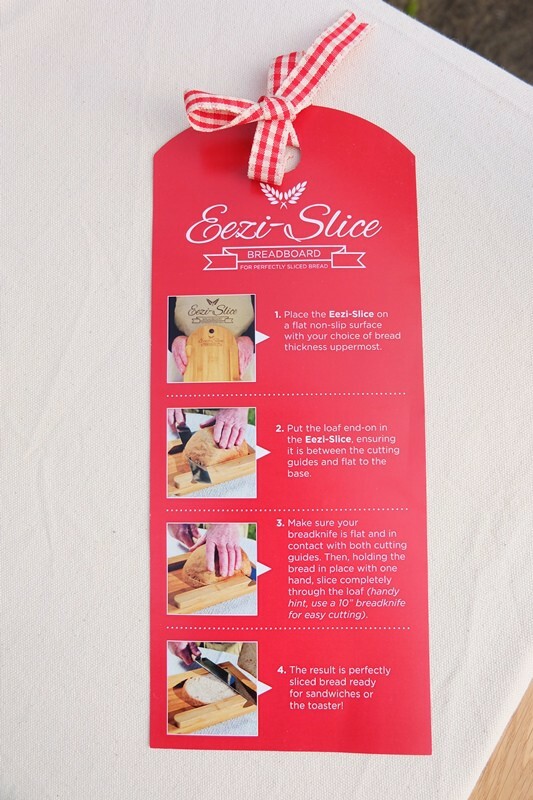 Prepare a bread tin (approximately 23 x 11 x 9.5 cm) and brush with sunflower oil. Knead the dough for another 5 minutes, then shape into an oval to fit into your bread tin. 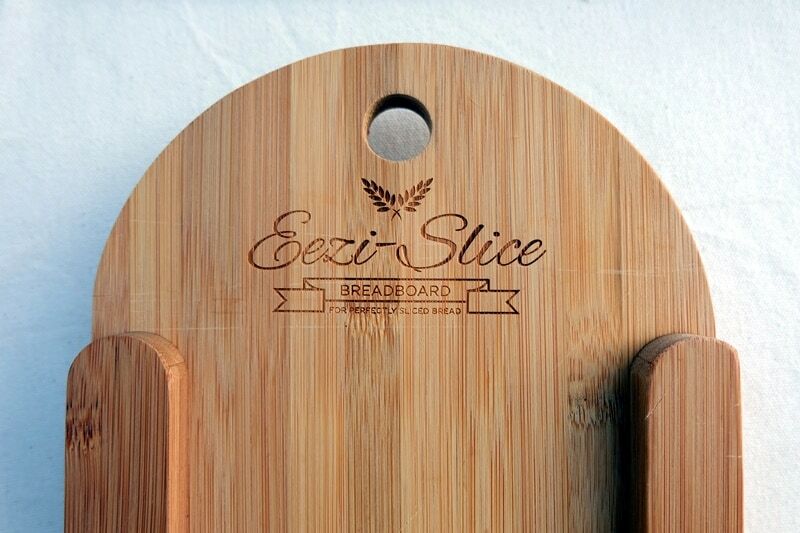 Brush the surface of the bread oval with water before rolling it in roughly chopped grains. Place in the bread tin, cover and proof at room temperature for several hours until it has risen to the top of the bread tin. Bake the loaf on the second lowest oven shelf for 15 minutes at 250C. Turn down the temperature to 180C and bake for a further 45 minutes. For a nice crust take the bread out of the tin at the end and place it back in the oven for another 15 minutes at 180C. Although barley is almost exclusively used in the brewing industry on account of its very low gluten content, barley flour is a really nice ingredient to introduce into bread baking. You’ll have even more reason for using barley if you are looking to keep the glycemic index (GI) of your home-baked bread as low as possible. I’ve been baking with barley flour ever since I came across the delicious barley rusks (used to prepare Dakos) hugely popular on the Greek island of Crete and after lots of research and experimentation I’d like to share my barley flour bread recipe with you. Firstly though, I want to give you some background on barley flour and the glycemic index GI/ glycemic load GL values of different types of grains. 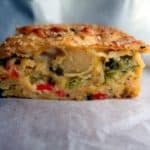 I’ve recently looked into low glycemic bread options as I’ve had to ensure my blood sugar levels were as stable as possible throughout the day for health reasons connected to my pregnancy. Out of all the grains, barley seems to come out on top. It contains a soluble fiber called beta-glucan which has been shown to slow glucose absorption and thought to help lower blood cholesterol. The Glycemic Index Foundation suggests that a GI of 45 or less is classified as low GI. For GL, 10 or less qualifies as low GL. From the table below, we can see that only barley is low GI and none of the grains or flours listed qualify as low GL. Nonetheless, barley scores well. 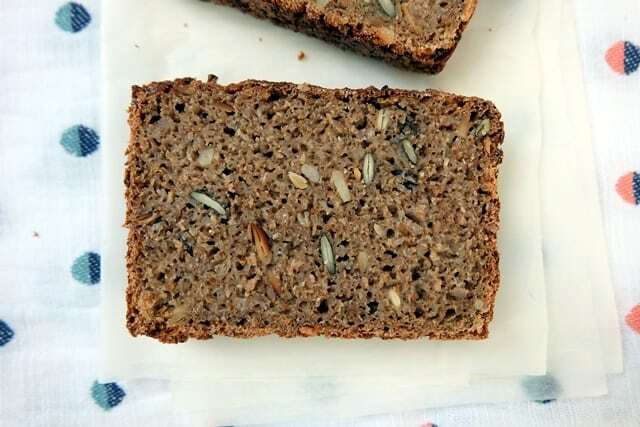 My barley bread recipe has taken inspiration from the above-mentioned Vogel’s sunflower and barley brown bread, incorporating both wheat and barley flours as well as sunflower seeds. 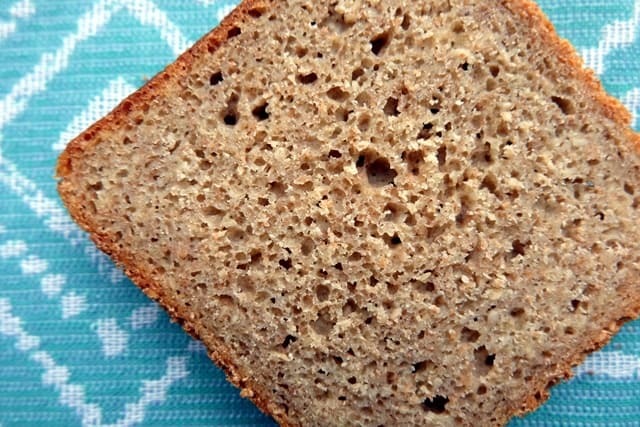 Opt for barley bread if you are looking for a hearty addition to a low-GI diet. 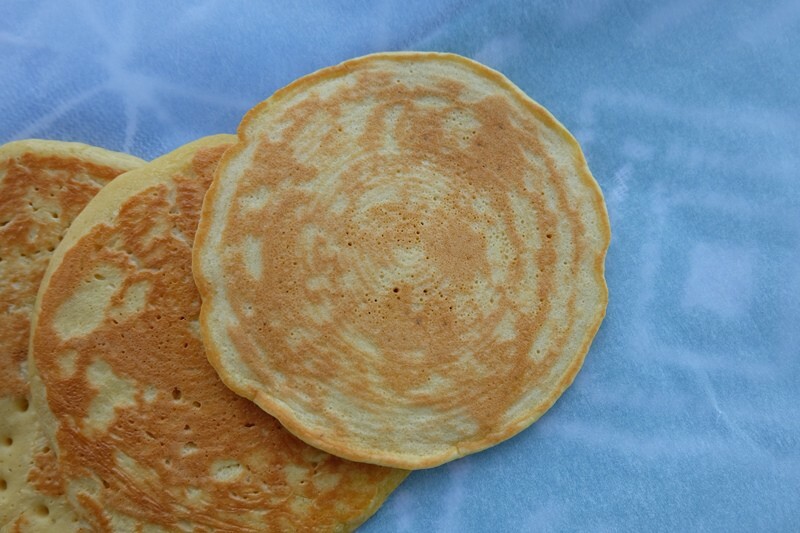 It is best to use barley flour in conjunction with high-gluten flour. My barley flour recipe uses 50% barley flour and 50% wholewheat flour to ensure the bread rises better. By adding at least 50% wheat flour benefits the crumb. In the interest of flavour and extensibility, I wouldn’t recommend to increase the % of barley flour. The higher the percentage of barley in relation to wheat, the less extensible the dough. I increased the dough hydration as well in order to account for the higher water absorption of the flours. 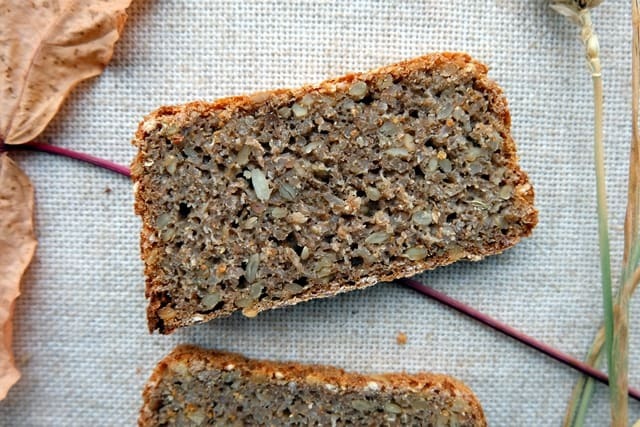 Barley flour adds a pronounced sweetness and a suggestion of maltiness to this loaf. This is even more pronounced due to the added barley flake soaker. Add in some pre-boiled barley kernels to make a coarser type of barley bread if you wish. In a medium bowl, combine all the sourdough ingredients, cover with a lid and keep at room temperature until the next day. Toast the barley flakes and sunflower seeds in a frying pan (no oil) to release the nutty flavours, then take off the heat, add the boiling water and cover immediately. Set aside at room temperature. Combine 100g of the refreshed sourdough (the rest goes back into the fridge for future bakes) with all the remaining ingredients (the soaker you prepared the day before and all of the main dough ingredients) and knead for about 10 mins. The dough will be sticky yet pliable. Leave the dough to rest for about an hour. Oil a bread baking tin and distribute a handful of sunflower seeds across the bottom of the tin, covering the surface evenly. Transfer the dough into the oiled and seeded bread baking tin, evenly distribute the barley flakes across the top of the dough and cover with a lid or a polythene bag to keep the moisture in. Rest until fully proofed (this takes a good 4 hours in my cool kitchen) and preheat the oven to 220°C in time. Bake at 220°C for 10 mins, and at 200°C for a further 40 mins. However, try to limit or cut out white bread (and other ‘white carbs’ such as white rice or pasta) during pregnancy as much as possible. Instead, opt for brown / wholegrain / multigrain breads, brown rice and wholemeal pasta. If you are prone to snacking on sweets, incorporate some dried fruit into your loaf of bread instead. 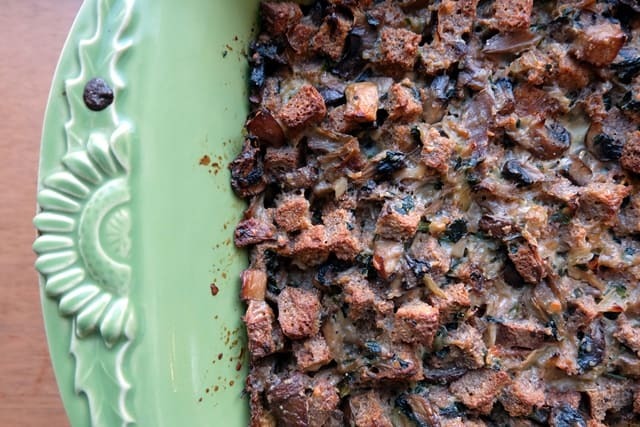 This date and nut loaf for example makes for a delicious breakfast bread or afternoon snack. Adding nuts to your bread dough will add some much-needed protein into your diet too and, in general, I recommend to add seeds (e.g. 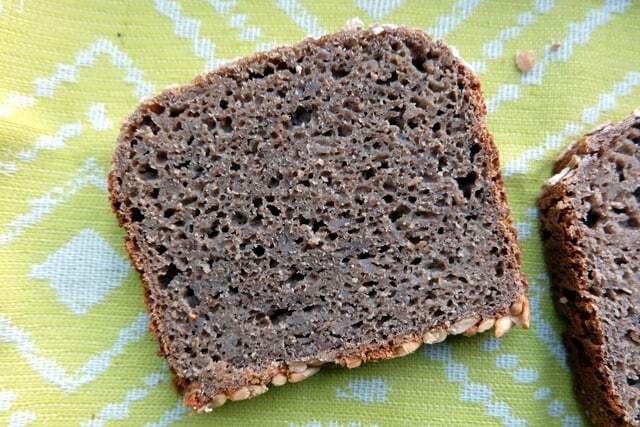 sesame seeds are a good source of calcium) and extra wheat bran (for added fibre) to any bread you bake. The best bread during pregnancy? 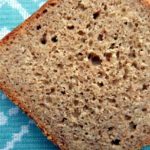 If you are looking to start baking your own bread during pregnancy or if you are looking to bake healthier loaves during pregnancy, take a look at this post on healthy bread from earlier this year. There is good dietary advice on the NHS (UK) website and a lot of this can easily be put into practice with your daily choice of bread. 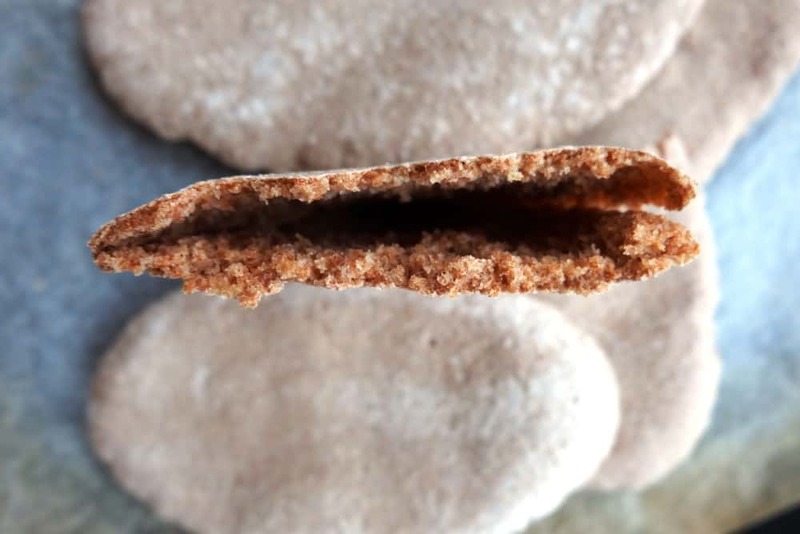 Try this wholemeal pita bread recipe and pair it with homemade hummus, carrot and celery sticks if you fancy a savoury snack. 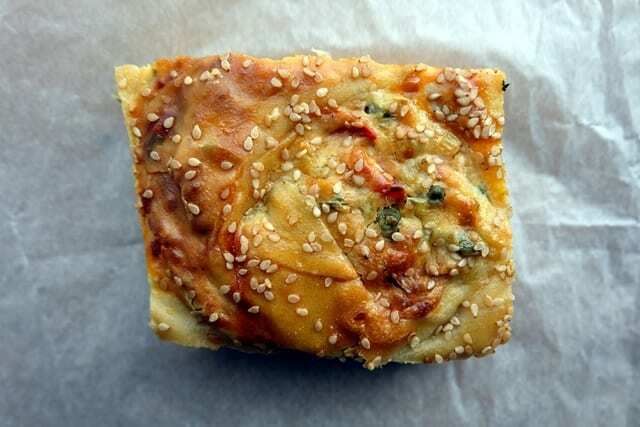 This Greek pastry snack with folate-rich spinach and feta cheese also ticks a few of the recommended dietary boxes. 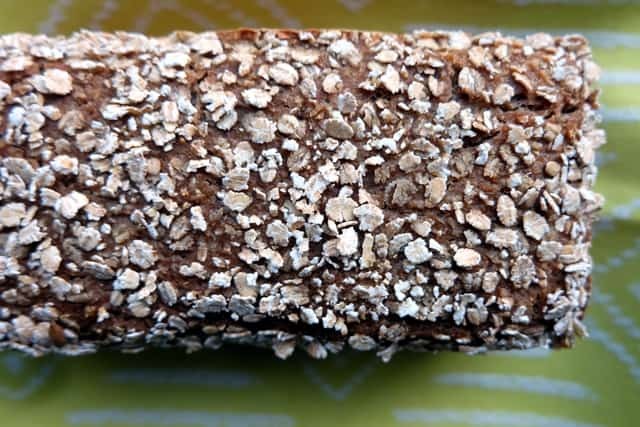 Crispbread can be a life saver in the first three months of feeling nauseous and queasy; I found it really easy to eat during the tricky first trimester. 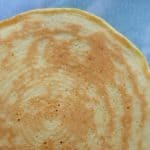 And if you are following a ‘eat little and often’ pregnancy routine, this oatcakes recipe is ideal. All content on The Bread She Bakes is provided for general information only, and should not be treated at all as a substitute for the medical advice of your own doctor or any other health care professional. The Bread She Bakes will not be responsible or liable for any diagnosis made by a user based on the content on www.thebreadshebakes.com and we are also not liable for the content of any external websites or links from this site to any other websites. Please always consult your own doctor if you’re in any way concerned about any aspect of your health.